We made a long trip to visit our U.S. based kids who were facing some pretty significant milestones this May. We journeyed through Upland, Indiana to take some much needed final exam snacks to our second semester freshman son and to take him off-campus for a few non-cafeteria meals.. We then continued to our eldest daughter’s graduation from Wheaton, saw my parents briefly and then spent a few days as “family” missing Matthew who is beginning his 3rd year of medical school while we resting at the beach. Our family dentist, dental hygienists. and office staff greeted us warmly and left us with healthy, shiny teeth. We left feeling thankful that we are always welcomed home graciously with last minute appointments and fixed what needed fixing! Another definition of family greeted us in Charlotte as we had a potluck/cookout and spent time reconnecting with the “family” who remains connected to us as we serve overseas. Some from our home church, others who have crossed our path along the journey. Folks who uphold us in prayer, support us financially, or are long and short-term friendships rooted in Charlotte and beyond. The most amazing thing about this evening was how many of our friends were interconnected and this time was for re-connecting! God is good at that, and we are thankful! We also spent time with Merrimom , extended family( welcome to the family, Lindsey! ) and enjoyed the home we rarely see now that we live in Costa Rica. Anna and I reconnected with some friends we made in Costa Rica who now live in Florida where our layover happened to be. 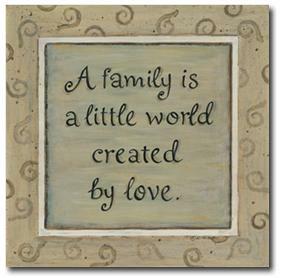 Family is just that….a little world created by love.. They are individuals that may be related genetically, are held in our thoughts and hearts, connected to through relationship or intentionality and sometimes, merely by proximity. Our overseas missionary family, friends, and neighbors welcomed us home on our return and the clinic staff in La Carpio greeted me warmly Friday…all examples of family to me and mine.